This is a really simple tute, which as you know, is always my favourite kind. When you’re building a puppet and you need it to be able to actually use it’s hands, then one way to do it is to create what is referred to as “real hands”, which is basically a big glove attached to the puppet which the puppeteer wears and then can use their own hands for what ever is needed. Like Rolfe, the piano playing dog from the muppets, used the puppeteer’s own hands to tinkle on the ivories. But you’ll have to forgive the photos, they were all taken on my phone. Firstly, you need to make a pattern. You need to know if you’re making the hand for an adult or a child, this is important in the fitting! 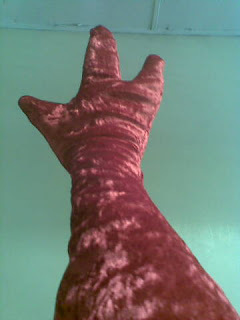 For this dragon puppet, the puppeter is a teenage girl, but it’s ok for it to be wrinkly, so I used my hand as a pattern. So grab the scrap piece of material and lay it out on the table, trace around your hand and arm, remembering to leave a couple of centimetres or about an inch as a hem allowance. Most puppets, like most cartoon characters, only have 3 fingers and a thumb, which are usually fatter and stumpier than a normal human hand. My theory on this is because it’s easier to make/sew/draw/animate than the thin long fingers that people have. But a) I have no proof, and b) I have digressed. This dragon only needed two fingers and a thumb, so this is what I traced. Place the pattern on the felt, pin it down and cut it out. 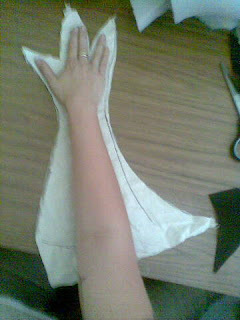 Then cut out a quilt batting hand, and fold the skin in half, right side in and cut out two skin hands. and sew around the edge. Then turn inside out. Slide your hand in and wave it around, pretending you’re the dragon/animal/monster/puppet. Let me explain the felt. When the puppeteer slides their hand into the Real Hand Glove, the last thing they want to have next to their own skin is the batting. So the felt is there to protect the human skin from the batting. 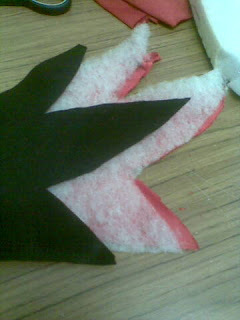 You only need one layer of felt, however, because the other side will be the inside of the puppet skin. Phew! Then do the same again, but ensure you use the other side of the pattern. That means that both hands will be the mirror opposite of each other. Look to your own hands to compare! And that’s it! A rocking pair of puppet gloves so you can pick up cups, write letters and play musical instruments through the puppet. Hey Dave, you’re most welcome! Do drop by with a link once you’re done! 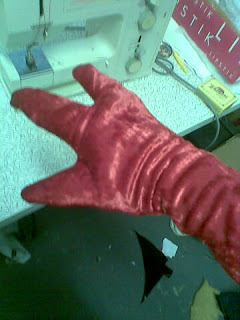 Well, I’ve created the hands for my muppet. 🙂 I quickly found that I’m rubbish on a sewing machine so I wound up taking the easy way out and I hot-glued everything together. It actually came out quite well. Next post: How wonderful are books?